In search of a detergent that’s safe for your cloth diapers and your baby? How do you know which is best? Selecting the right detergent can be overwhelming, but it can go a long ways toward making your cloth diaper experience more successful and enjoyable. 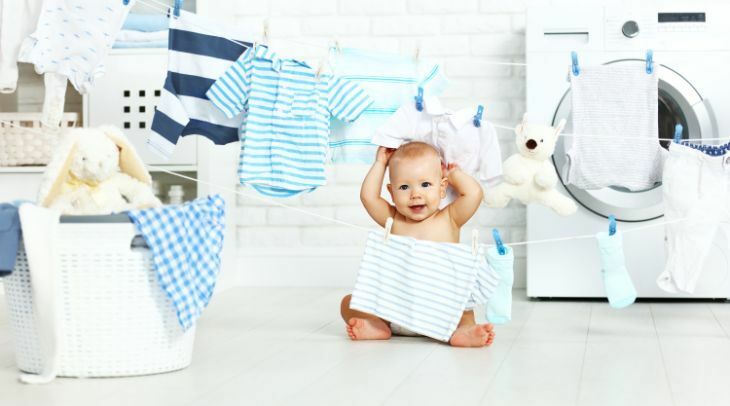 After reading this guide, we’re certain you’ll be able to find the detergent that works best for your cloth diapers, your family, and your washer. Use the links above to check the latest prices or read our in-depth cloth diaper detergent reviews below. Do I Need Special Cloth Diaper Detergent? Can I Use Homemade Laundry Detergent? While you do need to use a detergent that’s safe for your cloth diapers, you don’t necessarily have to use cloth diaper specific detergents. In fact, many of the detergents specifically marketed for use for cloth diapers are pretty weak and don’t do a good job at getting them clean. Some can even cause irritation or chemical burns if not washed properly due to the ingredients in them (source). You’re probably better off choosing a conventional option off the shelf. Detergent recommendations will vary based on your personal needs and your specific washing conditions, so there are a few things you need to sort out before shopping for a detergent. Type of washing machine: Do you have a high energy or non-high energy machine? If you have an HE, you will need to be on the lookout for a true HE-safe detergent that will keep the suds at bay while maintaining cleaning power. Plant-based or synthetic: Is using environmentally-friendly products important to your family or do you just want a detergent that is convenient and works? If your baby has sensitive skin: If your baby has sensitive skin or sensitive skin runs in the family, then you will want a fragrance-free detergent that won’t cause irritation. How much you want to spend: If you’re on a tight budget, you will need to factor in detergent costs, as you will be washing diapers at least once or twice a week. Hard or soft water: You will need to test your water hardness before searching for a suitable detergent. You can purchase test strips in the fish or pool section at some stores or you can take a water sample into your local aquarium store and they will generally test it for you free of charge. If your water is between 0-60 parts per million (ppm), you have soft water. If your water is above 120 ppm, you have hard water and will need to add a water softener to your wash routine. Every detergent is a little different, but there are a few keys factors that make a detergent great for washing cloth diapers. Enzymes: Enzymes help break down stains and boost cleaning power. However, there is some controversy over enzymes and if they irritate sensitive skin. Scent: Having a scent that you like and won’t irritate your baby’s skin will help you narrow down your detergent choices. High concentration of surfactants: Surfactants should be at the top of the ingredient list on your detergent. They are the part of the detergent that softens and releases soils from fabrics. There needs to be a strong enough concentration of surfactants in order to sufficiently clean human waste out of your diapers (source). A permanent mountain of laundry is a fact of life for all moms, which is why I’m all for taking the time to find a detergent that works hard for you. If you’re cloth diapering, you’ll have specific needs to consider — since nothing will make you switch to disposables faster than feeling like you’re not getting your diapers really clean. If using environmentally-friendly products with fewer chemicals is important to your family, you will want to choose a plant-based detergent that actually works. 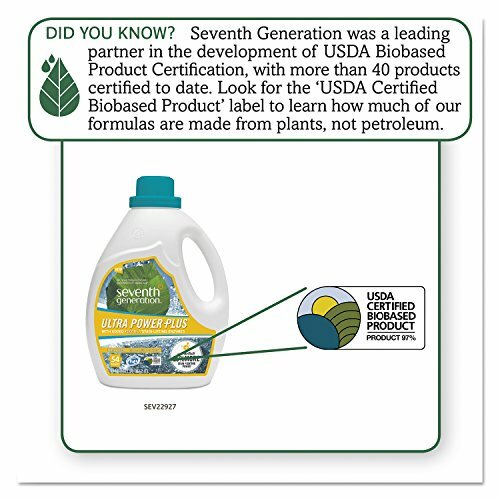 Many plant-based detergents have weak formulas, so you will want to find one strong enough to tackle human waste. Seventh Generation Ultra Power Plus is a plant-based option that’s gentle on the environment, but strong enough to sufficiently clean your baby’s dirty diapers. It contains triple enzymes to remove even the toughest of poop stains. This eco-friendly detergent is also free of dyes, optical brighteners, and synthetic fragrances, making it non-irritating to your baby’s delicate skin. Just like with any plant-based detergent, you will need to wash your diapers in hot water for the main wash and probably use 1.5 to 2 times the amount of detergent recommended by the manufacturer. You will also need to use a water softener if you have hard water. We have been using this detergent on our cloth diapers for over a year now, and I couldn’t be happier. Our diapers come out clean and smelling nice, and we haven’t dealt with a single stink issue. I love not having to worry about any harmful chemicals being against my baby’s skin or ending up in our environment. Not all major retailers carry it. Tide is one of the most well-known laundry detergents, but there are so many varieties now, how do you know which one is best? When it comes to Tide and cloth diapers, the simpler, the better. Many avid cloth diaper users swear by Tide Original Powder. In fact, many environmentally-conscious parents will end up using Tide Powder for their cloth diapers because it does that good of a job at cleaning them. 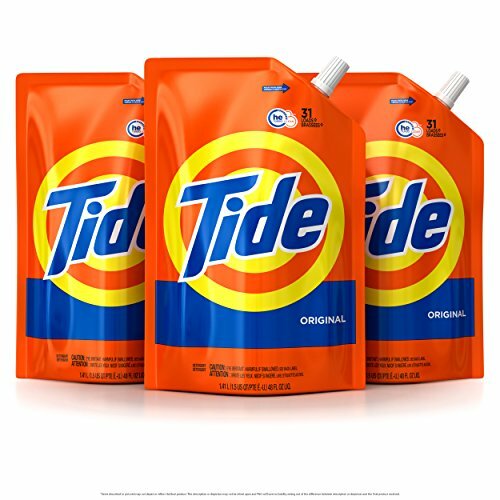 Tide Powder is sure to leave your diapers smelling good with minimal to no stains. This super soluble detergent works well in hot or cold water and will leave your cloth diapers virtually residue free, preventing build-up and leakage issues. Plus, it’s rather affordable for most families. Because Tide Powder has a built-in water softener, you don’t have to add in an additional water softener to your routine unless your water hardness is over 180 ppm. This is great if you have hard water, because it will help simplify your wash routine and cut down expenses. If you’ve been having issues getting your cloth diapers clean, you may want to give this simple and traditional detergent a try. Great option for hard water. Packaging is more environmentally friendly. Potential to create suds in soft water. Large, heavy box can be difficult to haul and store. With cloth diapers, you’ve got a lot of laundry to do. You don’t want to be constantly running out to get more laundry soap. By purchasing a bulky detergent like this one, you’ll save both time and money. It’s got a highly concentrated formula so you get a powerful clean without any fillers, dyes, fragrances, or other harmful chemicals. Each bag contains 45 ounces of powdered detergent, which can clean approximately 90 loads of laundry. However, since you’ll only need a few tablespoons per load, it will last forever. The gentle, yet deep clean is great for babies with sensitive skin, chemical sensitivities, or allergies to fragrances. 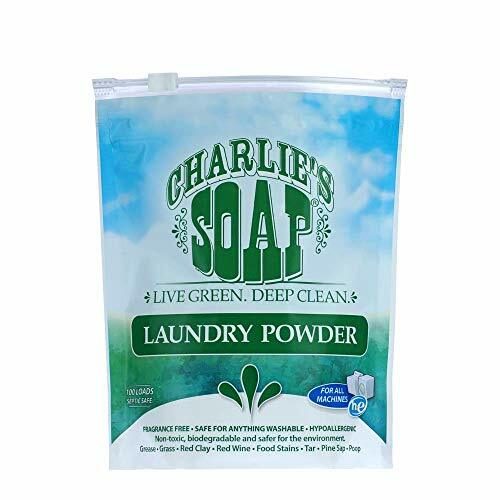 This is a natural detergent and works best with soft to moderate water. It’s also been formulated to be compatible with any type of washing machine. You won’t have to worry about residue or nasty buildings. Natural formula provides gentle, but deep clean. Bulk bag gets you through multiple washes. Formulated to work with any washing machine. No laundry scoop or spoon is included. This laundry power provides a deep clean for a great price. You just need one tablespoon of detergent per large load. A single bag can get you through 100 loads. There’s a lot of advantages to a powder detergent like this one. It sinks deep into the fibers of your cloth diapers, but won’t leave any residue in your clothes or laundry machine. Plus, you can use it on a wide variety of fabrics, so it’ll work on cloth diapers and anything else you can think of. We also really like the eco-friendly factor. The formulation of ingredients surpasses the minimum standards for biodegradability and is non-toxic. This means it’s safe for your little one’s sensitive skin. It also means you won’t have to deal with heavy fragrances. With a lower environmental impact per laundry load than leading detergents, you’ll feel good about how you’re taking care of your baby and the environment. Eco-friendly, non-toxic formula is safe your baby’s sensitive skin. A little bit of powder goes a long way. Won’t leave residue in your washer. It may leave spots on black clothing. If your baby has sensitive skin, you will need a fragrance-free detergent with major cleaning power. You will want to make sure you have a good wash routine down with an extra rinse or two to get rid of any leftover detergent. 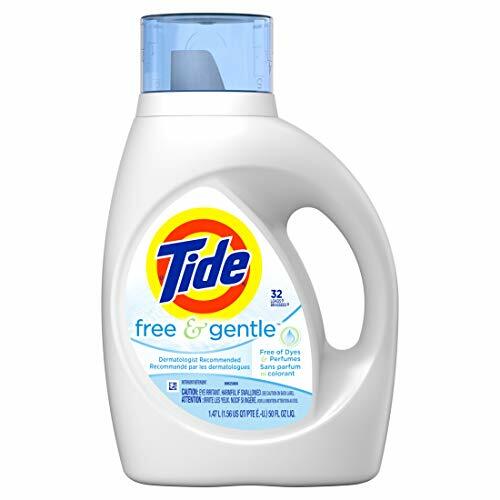 Tide Free & Gentle is a great free and clear detergent option that is safe for cloth diapers. This is extremely important because you need to make sure your detergent is strong enough to sufficiently clean your soiled diapers, but gentle enough it won’t cause any irritation to your baby’s delicate skin. The amount of surfactants in Tide Free & Gentle attributes to its amazing ability to clean and fight stains, while its lack of dyes and perfumes makes it an excellent choice for even the most sensitive of skin. It’s even recommended by dermatologists, so you can feel comfortable using it on all of your baby’s clothes. As with any free and clear detergent though, it is somewhat weaker than its fragrant counterpart, so you will need to use 1.5 times the amount of recommended detergent in your main wash. Some parents don’t like that it’s synthetic. Out of price range for some families. Many households already use Tide liquid for their laundry needs, so why not use it for your cloth diapers as well? 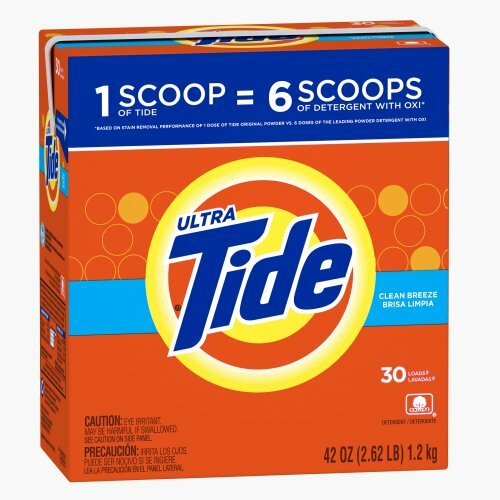 Several cloth diaper users have had great success with Tide Original Liquid HE Turbo Clean, and they love that they don’t have to buy separate detergent for their clothes and diapers. All scents of Tide liquid do an excellent job at cleaning cloth. Tide liquid has shown to be effective against stubborn stains, clean efficiently with a small amount of water, and minimize suds in front loader and HE machines. The new HE Turbo Clean technology provides 6 times the cleaning power in half the time compared to leading bargain brands, allowing you more time to spend with your baby and less on dirty diaper laundry. It also cleans well in cold water, so you can save even more money and energy than you already were by using cloth. Often sudsy in soft water. Certain enzymes help to break down different stains and rinse out detergent. Most common in detergents is the enzyme protease, which kills bacteria and breaks down protein-based stains like poop. If you choose a detergent without enzymes, you may want to consider adding an enzyme booster, such as Biz, to your wash routine. Arm & Hammer baking soda is well known for its cleaning power and ability to eliminate odors, and you can trust that their detergent will do just the same. 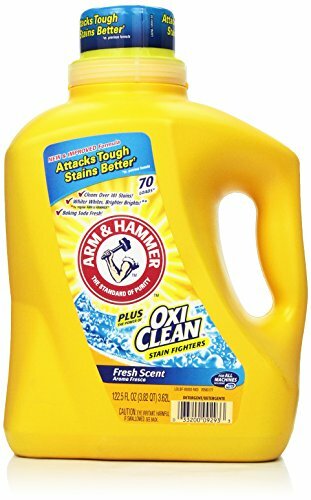 Arm & Hammer Plus OxiClean contains enzymes that are designed to break down over 100 different stains, so you won’t have to stress over those pesky poop stains. It even works great as a spot treatment on stains. Your diapers will be sure to come out smelling fresh with this detergent. Your white diapers will come out whiter and your colors brighter, but you won’t have to worry about dark colors fading. This affordable detergent can be found at almost any major retailer and can be used for both your diapers and your clothes, so you won’t have to purchase two separate detergents. Good choice for hard water. Plastic bottle puts a strain on landfills. Some parents find the scent too strong. You can still use pretty much any detergent in soft water, but some powdered detergents with built-in water softeners, such as Foca, can be sudsy. Using an HE detergent in general, even if you have a standard washing machine, will greatly help keep suds down with soft water. 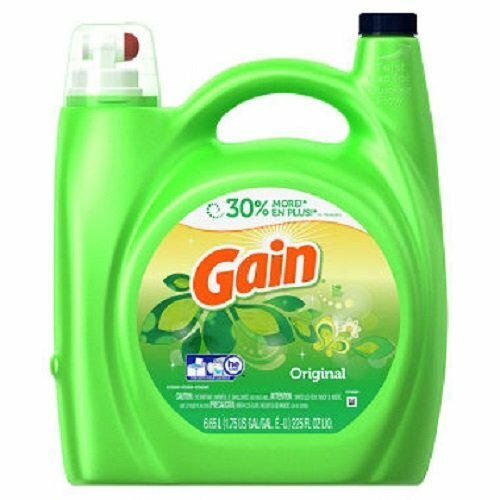 Getting your cloth diapers clean is easy peasy with Gain Liquid. Your diapers will be clean, residue-free, and come out smelling great, even if you have super soft water on your hands. 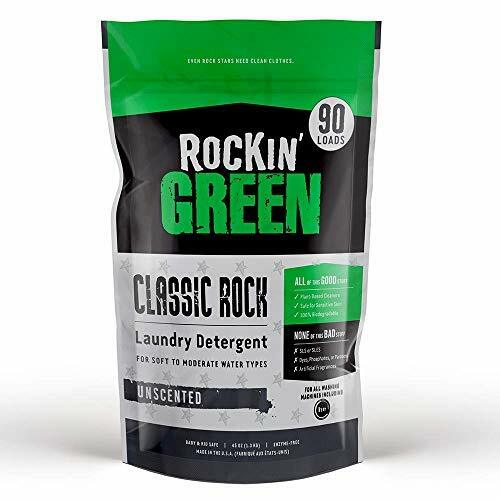 Plus, it’s color-safe and can be used for all your laundry needs, so you won’t have to spend money and time on buying two separate detergents. Gain liquid does an excellent job at keeping the suds at bay, even in super soft water with sud-sensitive machines, like HE front loaders. It also does an excellent job at removing those stubborn poop stains. If you have soft water and want a detergent that will get your diapers clean and smelling nice for a good price, this may be the perfect detergent for you. Not great for sensitive skin. Plastic bottle creates strain on landfills. Not affordable for some families. If your water tested above 120 ppm, you have hard water and will need to add a water softener to your wash routine. However, with some mainstream powdered detergents, a water softener isn’t needed until around 150-180 ppm, as they have built-in water softeners. Life should be easier with Foca powder, as water softener isn’t needed until 150 ppm. However, if your water hardness is over 150 ppm, you will need to add a half cup of Borax or 1 capful of Calgon to your main wash. This will make sure your detergent is working effectively to get your soiled diapers clean. 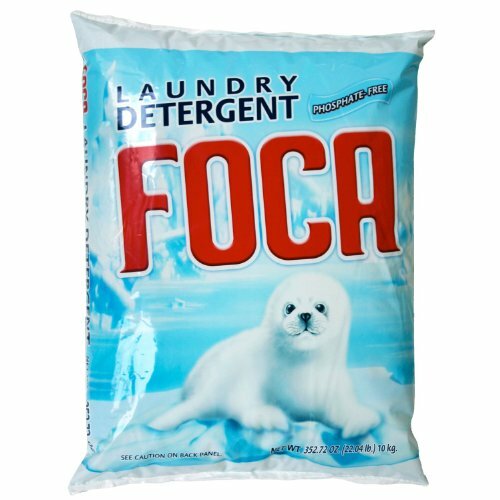 Foca Powder also tends to rinse cleaner because of its built-in water softener, so you won’t have to worry about detergent residue, which can lead to absorbency issues. Foca powder also has a very light and gentle scent to it, so you won’t have to worry about your cloth diapers smelling like chemicals, and it won’t irritate your baby’s delicate skin. 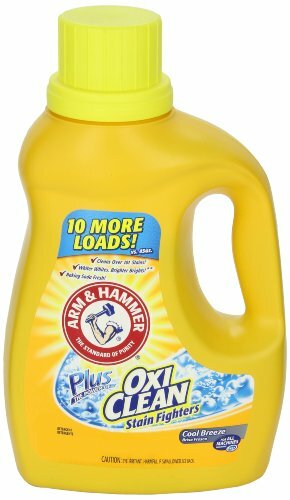 This is a very inexpensive detergent that requires very little volume per load, so you can maximize your savings with cloth. However, Foca Powder isn’t considered safe to use in high efficiency machines, so if you do have hard water and an HE machine, I would look into using Tide Ultra Powder HE or Gain Powder HE instead. If you’re on a tight budget, you’ll need a detergent that will give you the lowest cost per load. Luckily, there are several cheaper brands of detergents that are excellent for washing cloth diapers. The detergent you pick will also need to suit your family and washing condition needs. 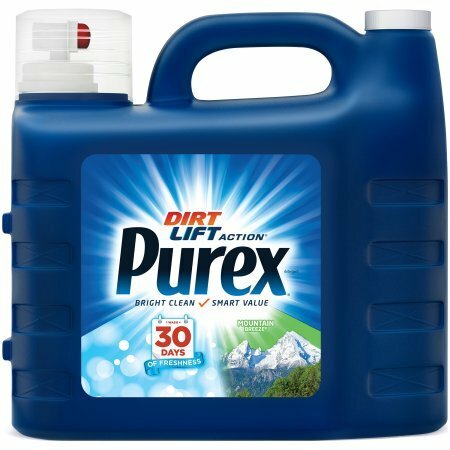 Purex is a great option if your family is on a tight budget. You can use this inexpensive detergent on both your diapers and your clothes, so you won’t have to worry about buying two separate detergents all the time. You can even use this cost-effective detergent in hard water with the addition of a water softener. Purex does lack enzymes though, so if you find yourself dealing with stubborn stains, you may want to try Purex Plus Oxi or add in an enzyme booster, like Biz to your wash routine. Purex also comes available in Free & Clear, Baby, and Natural Elements options, so you still have cheap alternatives if your baby has sensitive skin or if you want a more environmentally conscious option. All of these detergents are highly recommended in the cloth diaper world. Some moms don’t prefer their fragrance. Fabric softener: Avoid any detergent that contains a fabric softener, as fabric softeners will cause your diapers to lose absorbency and result in wicking and leakage (source). Soap-based detergent: Soaps can cause films or residue on your diapers and can cause repelling. Pods: Due to the risk of accidental ingestion, it is best to just avoid having laundry pods in a house with small children. Coconut-oil-based surfactants: If you see sodium cocoate or saponified coconut oil on the label, steer clear, as these tend to build up on fibers, trap soils, and cause repelling issues. Bleach: It’s not recommended to use bleach with every wash cycle, or even monthly. Bleach should only be used when disinfecting previously-owned diapers or if your baby has had a yeast or bacterial infection. You should also never use bleach if you have iron hard water (source). Many parents may be compelled to use homemade laundry detergent because it’s cheap and made with simple, natural ingredients. Homemade detergent is not actually detergent at all, but rather a soap and is not recommended for cloth diapers or any laundry for that matter. Homemade detergents are usually comprised of water softeners, boosters, and soaps. Over time, the soap will build up and trap bacteria and other particles in the fibers of fabrics, so your cloth diapers will not be getting properly cleaned. Soap residue is also known to get stuck to your washing machine and could cause irreparable damage over time (source). If you were hoping to use a homemade laundry detergent to reduce chemicals, don’t worry, there are tons of other “green” options out there for washing your cloth. As a general rule of thumb, it is best to start with the detergent manufacturer’s dosage recommendation for washing your cloth diapers. From there, you may need to adjust the dose down for very soft water, or up for hard water (source). You will probably also need to use 1.5 to 2 times the amount of detergent if you end up using a plant-based or free and clear option. Being a natural-minded mama, I’d have to say my favorite detergent for washing our cloth diapers is Seventh Generation Ultra Power Plus. I’m able to get our diapers cleaned sufficiently without exposing my family or our environment to harmful chemicals. This is a perfect detergent if you’re planning on using cloth and want to reduce your exposure your toxins even more. After you figure out what type of water and washing conditions you have, finding a suitable detergent will be a breeze. Compare all your choices and determine what is best for you, your family, and your baby’s diapers. You’ll be a cloth diaper pro in no time! Have you tried the Seventh Generation Free and Clear detergent for cloth diapers? Hi Emily, I have not. Everything I’ve read has always said that Seventh Generation Free and Clear was too weak of a detergent to really clean cloth diapers. Other Seventh Generation detergents are strong enough though. I’m planning to use the Seventh Generation laundry detergent for my cloth diapers, but I just found out that my water is hard so I would have to use a water softener. What would you recommend I use that is a safe or natural option? Would borax be okay? Borax is great to use as a water softener, and it is what I personally use. How much borax you use will differ based on how hard your water is. You can find out more in this article https://momlovesbest.com/wash-cloth-diapers. Have you tried Unicorn Beyond Clean? 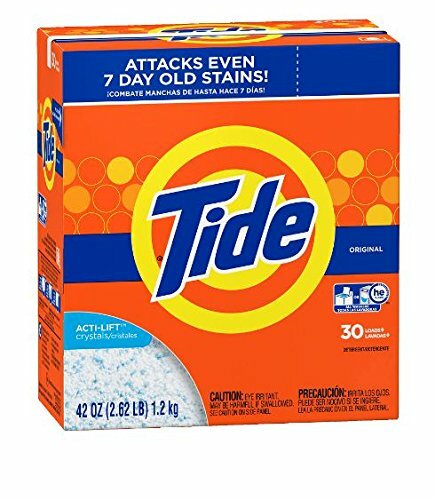 I was using Tide until recently when I was given a free sample of this detergent to try. I was blown away at how much better it cleaned. I have not tried this detergent, but thanks for the suggestion! Have any other mama’s tried this?